Older children and teens will enjoy surfing waves on the Dumbi but it will be too big and heavy for smaller children. 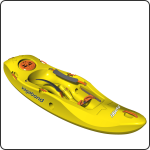 For little ones, we recommend our children’s kayak, the Kwando, which can easily handle small waves. Yes, small-sized dogs – like water-crazy Jack Russells – can easily sit between your legs. The Dumbi can definitely be taken on dams and rivers where it is fun to paddle. It just won’t be as fast as one of our sit-on-top recreational kayaks. The Dumbi will happily paddle behind the backline, taking the swell in its stride. 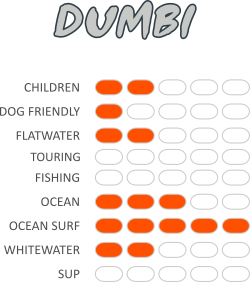 The Dumbi is a surf kayak with real performance characteristics. It can punch through waves, surf, carve, spin and edge. Designed to surf ocean waves, the Dumbi is a good sport on rivers where it can surf rapids too.